Aborted unveil title track of forthcoming album "TerrorVision"
The Belgian death metallers Aborted presented the lyric video for the title track of the forthcoming album "TerrorVision". The release of the 10th LP will take place on September 21 via Century Media Records. Sven de Caluwé (vocals) states: "This song is the title track of the record first off and has Seth Siro Anton from Septic Flesh as guest vocalist. Basically we chose it as a single because it has the dark, dirty vicious atmosphere the album has, it's fast but also has hooks and a heavy part. Lyrically, it captures the whole concept of the album, which is let's say looking at the media these days as if it were an ancient 'evil' entity in an 80's horror film that is manipulating the world as puppets." "TerrorVision" recording process took place at the Kohlekeller Studio in Germany under the guidance of Kristian 'Kohle' Kohlmannslehner — follow the link to read our material in which the German producer names the main mistakes of home production. 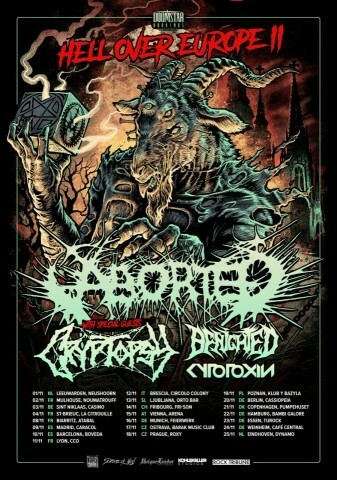 In support of the new album, the band plans to go on a European tour in early November, along with Cryptopsy, Benighted, and Cytotoxin. See also Aborted's videos "Squalor Opera" and "Fallacious Crescendo".